Kitt, the car that did almost everything, is being sold for $150,000 in California. The car was a part of "Knight Rider", a hit television show in the 1980s which starred David Hasselhoff. 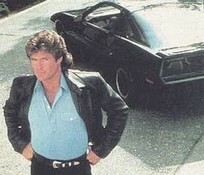 Kitt, which stands for Knight Industries Two Thousand, was actually one of four cars used on the show. Unlike on the show, the real car does not speak, drive itself or fly through the air. 1. Kitt is a nickname for a car. 2. The sales price for the TV show is $150,000. 3. Kitt and four other cars were used on the show. 4. What did Kitt do on the show? A. It spoke and clapped. B. It flew through the air and spoke. C. It drove itself and fought crime.